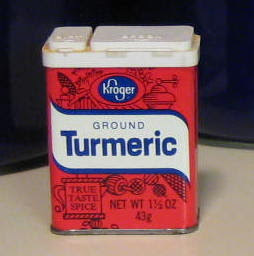 A can of turmeric! It is commonly used as a culinary spice in Far East cuisine. 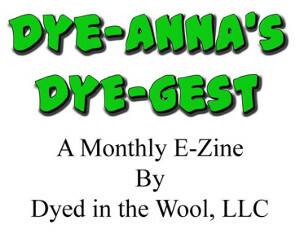 According to this article in Wikipedia, it is also used as a food additive for coloring foods and protecting them from sunlight, as a dietary supplement for digestion, as an antiseptic in Ayurvedic medicine, as an experimental cancer treatment in clinical studies in Western medicine, in cosmetics, as an ingredient in radiator stop-leak sealant mixtures, in gardening to deter ants, and as a dye. It's been eons since I shopped at a Kroger. The last I remember was when I lived in Houston, some 18 to 20 years ago. The fact that this tin is still full after all those years, gives you some idea of the kind of cooking I do (or don't do.) But that's okay, because since that time I've become a fiberist and am going to use this for some natural dyeing. Hopefully time has not effected it's potential as that regard, but that is something I intend to find out. More on that soon. Oh, fabulous. You'll get the most lovely yellow out of that. I'm sure you know you need to mordant it. I did some lovely tumeric dyeing last year with some old tumreic. And then I went out and bout some more! I also started making curries which call for tumeric so I have a steady stream of it coming through the house now. I like how your spring cleaning involves unearthing many things that can be used for dyeing!! I have some similarly ancient spices in my cupboards as well. I didn't know that Kroger was still in business - not living in Kroger country any more. But sure enough, they are! If only I were as motivated to clean as I am to read blogs! Geodyne, I haven't done my homework on tumeric dyeing yet, but I figured it would need a mordant when I read in Wikipedia that it made a "poor" fabric dye. Fortunately, I have a large chunk of mordanted fleece, just waiting to be wetted and dyed. Jackie, I remember those posts! I'll have to re-read them. I have spices that my mom had some 20 to 25 years ago. I don't know why I keep them. I can't wait to see how the dying comes out. It's my understanding that where turmeric is used to dye buddist robes they re-dye them every year. For a screamingly bright yellow, try premordanting with tin. Just remember, turmeric isn't light fast, but it is a cool color while it lasts, and a favorite at my dye day events. Mordanting will help, but I have even seen many a Navajo rug around here - older ones to be sure - that has faded in spots if it's used much, such as for saddleblankets. That's why some of the Navajos have turned to analine dyes, which is a sad thing in itself. Isn't that odd that it is an ingredient in radiator stop-leak sealant mixtures? I love tumeric. It dyes a gorgeous gold/yellow. And it's a major ingredient in a recipe I have for yellow pea soup. Yum!